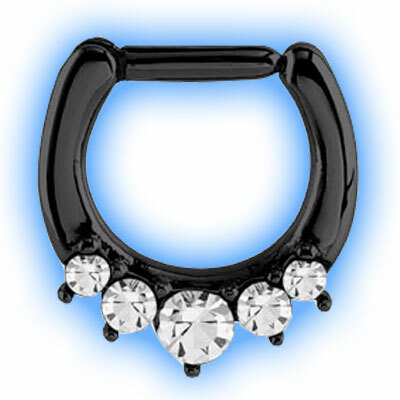 This is a stunning Septum Ring set with 5 Clear Gems which really stand out against the Black PVD. It looks stunning in Septum piercings and because it has a hinge at one side of the bar and a clicker fastening the other side it can be fitted securely and easily. It is 1.2mm (16 Gauge) or 1.6mm (14 Gauge) and the bar measures 6mm or 8mm internally.